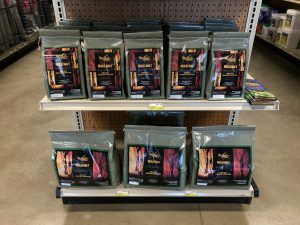 Argyle Feed Store is one of a few stores carrying Nolo Bait! Stock up before they are gone! This EPA registered biological control for grasshoppers also controls Mormon crickets. Nolo Bait contains Nosema locustae spores and these spores are then applied to wheat bran. The grasshopper eats the bran and the spores poison them. The younger the grasshopper the less time the spores will take to infect them. As the Nosema locustae builds in the stomache of the grasshopper, they become tired and reduce their food intake. Healthy grasshoppers then feed on the infected ones as an additional food source. This process then spreads the spores to the whole grasshopper population including female grasshoppers who are in the egg-laying process. This helps keep the grasshopper population down and helps the farmers. You ask how long does Nolo Bait work? Well typically it takes 3 weeks for young grasshoppers to die off. This product is considered a long-term suppression product so grasshoppers will not die overnight. Instead the spores that cause the infection will decrease feeding and reproduction. By continuously using this product each season allows for lower egg production and lessens the survival rates. Apply at a minimum rate of 1 pound per acre per application. This rate is based on a density of 8 or fewer grasshoppers per square yard. If the population is heavier, multiple applications may be necessary. You should begin applications during the spring hatch and continue throughout the season until grasshoppers reach adulthood. Get your Nolo Bait for grasshoppers and crickets today and control these pests before its too late! This entry was posted on Friday, June 22nd, 2018 at 5:33 pm	and is filed under News & Updates. You can follow any responses to this entry through the RSS 2.0 feed. Both comments and pings are currently closed.